Sisters of Compassion congregational leader Sr Margaret Anne Mills gave this tribute at the funeral of Sr Dorothea last December. We come to pay tribute to a long life, a life of love and commitment. At birth Mary Meade became visible in tahe world; at death she surrendered to the invisible. In between these two points is the journey, the beauty and the frailty of life. 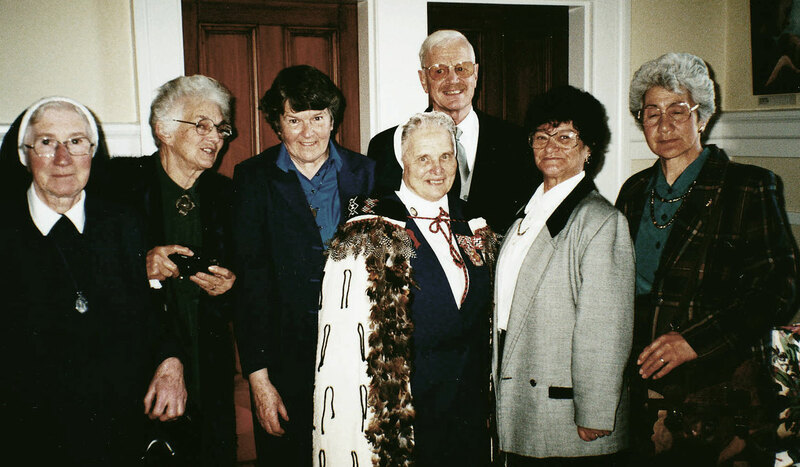 Sister Mary Dorothea was born in Whanganui 14 July 1923, the second eldest of eight, and entered the Sisters of Compassion on 27 January 1940 making her profession three years later. She qualified as teacher in 1952 and completed several years of study in the social sciences. Sr Dorothea spent the first 10 years of her life as a Sister of Compassion at either Jerusalem or Rānana teaching in the schools. From 1958 to 1981 sisters worked at our home for disabled children and young people in Carterton. Dorothea was forward thinking in her approach to young people with disabilities. She was instrumental in founding the National Games for people with Disabilities, a forerunner to the Paralympics. She was an innovative teacher and brought passion and vision to this specialised area of education in which she was held in high regard. Her interest and love for these young people continued throughout her life. She has supported many old boys and girls from St Raphael’s Home of Compassion. After 23 years working with the disabled, Dorothea returned in 1981 to working in the Māori Pastoral Team initially in Flaxmere and then back to the Whanganui River, either at Jerusalem or Castlecliff. Over the years she played a significant part at the Hui Aranga. Many of you here have been part of the religious quiz. Remember you were either right or wrong according to the partnership between Aunty Biddy and Sister Dorothea. Thank you to all the sisters, the family, whanau, members of the parish and the diocese for your support of Sister. She loved you and you were all important to her. Just over a year ago, some of us gathered here today planned this time with Dorothea. Lots of prayer, korero and debate went into how we could celebrate. She had a doggedness that could be frustrating at times. Yet as I stand here today I have to say graciousness and beauty have prevailed. Sister Dorothea has been a Sister of Compassion for 70 years and has always been a living expression of the words that are on our Congregational Crest ‘Love in sacrifice’. Her total commitment and dedication to the life she freely chose have been recognised with a Queen’s Service medal and a Papal honour and we all share in these honours.